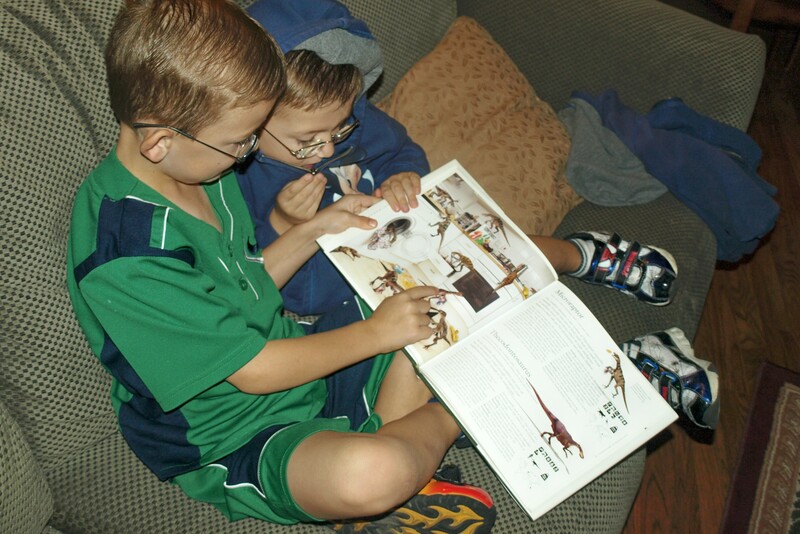 Full Speed and T.Puzzle catching up on some dino-facts. In our home the questions are relentless. When I’m about to eat a nice brunch at a lovely dining establishment I don’t really want to ponder why carnivorous dinosaurs have tiny arms. Yes, meat-eating dinosaurs can be quite large and yes, some of these have oddly sized chicken arms. Do I need to discuss this at length? No. Do I even know that much about dinosaurs? Not really. Should I consider pursuing an advanced degree in paleontology? To save my sanity probably yes. Once we all were seated at the lovely dining establishment and about to peruse our menus, Full Speed says, “Mom, Mom, Mom!” He’s holding a miniature plastic dinosaur in his hand as he attempted to grab my attention.